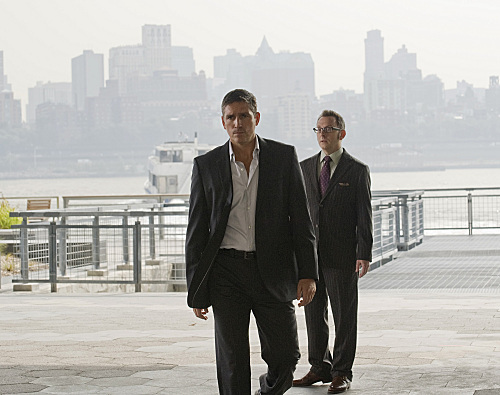 It’s taken seven episodes, but Person of Interest finally did something…well, of interest. This week;s episode “Witness” made it seem like the big twist for the show would be the severing of ties between Reese and Finch as they tried to protect a teacher named Charlie, played by Enrico Colantoni of Veronica Mars and Just Shoot Me! Charlie becomes an unsuspecting witness to a mob murder and now must be protected. When Reese goes to save him, his cell phone breaks, also breaking any discussion between the two for the first time in the series. The rest of the episode focuses on Reese and Charlie hiding out in an apartment complex away from the mob. Charlie is a good teacher, almost too good. When he runs into a student at the apartments, he even has time to discuss The Count of Monte Cristo (which Jim Caviezel starred in the film version of. Coincidence?) when the mob is knocking on doors trying to find him. Meanwhile the police realize the mob murder may have something to do with the much hinted-at Elias. They’re getting closer to finding out about the well-hidden character. The episode goes together like any other episode of Person of Interest: Reese and Finch are reunited, the police move closer to Elias, Reese says several lines of heavily cheesy dialogue, etc. Finch even meets the cop that Reese has been blackmailing, possibly hinting at a much deeper cohabitation between Reese/Finch and the police. Also fun fact: 99 percent sure that the new cop that was introduced was the guy who does the Twilight Zone Geico parody ads. Weird, but fun casting choice. Everything seems like it’s about to be wrapped up with a pretty bow, as it usually happens on PoI…until a great third act reveal. The mob were actually trying to kill Charlie instead, because Charlie is actually Elias! Thinking back on the episode, this should have seemed obvious, but the episode pulled off the show’s biggest surprise quite well. We learn that Elias is trying to make the world a better place as well, but by taking it over borough by borough. This is an interesting contrast to Reese, who is slowly trying to save New York City person by person. Elias also seems very taken by the skills that Reese has to offer. I wouldn’t be surprised if later in the season, or even in the season finale, if Reese was offered a job with Elias instead. But we’ll see how long it takes for Elias to show up again. Hopefully it won’t be too long, as his appearance gave the show a great new change that it desperately needed after only seven episodes. It will be great if PoI can give more focus to this larger story than individuals in further episodes, but we all know by now that what PoI should do is very different than what it will do. As for now though, I’m going to be optimistic and hope that PoI will take advantage of the interesting twist they’ve added to the show and not bury it under more mediocre stories that couldn’t be less interesting week to week.